With great rich red colour, the Burgundy Iceberg rose is just as vigorous and hardy as the white variety, just a more sumptuous colour. This is actually a sport of the original, and it is available as a standard as well as a bush type rose. The fragrance is pleasant, and certainly not overpowering, the disease resistance is excellent and the foliage is good green. As a bush rose it will reach around 1.5 metres in height and spread to around 1.2 metres. It will repeat flower and is very easy to prune. Being a Floribunda type is does have masses of flowers so you will not be wanting for a display for most of the year. Use Burgundy Iceberg as a feature plant in the garden, grow it in a container or plant it en masse as a border plant. 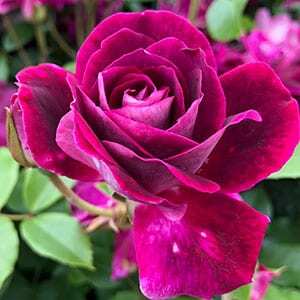 We suggest using a general purpose rose food such as Sudden Impact for roses with an application every 8 weeks from early spring through summer. Regular seaweed fertiliser application will also help keep you Burgundy Iceberg flowering freely.